Most unlawful telemarketing calls are made with an “auto-dialer”. An auto-dialer is a machine, computer program or equipment that stores or produces lists of telephone numbers then proceeds to call those numbers without human intervention. There are many different kinds of these machines and computer programs but what they have in common is that telemarketers use them to mass-harass millions of people every day. There are certain tell-tale signs of an auto-dialer that you are probably already familiar with. You answer the phone and instead of a real person promptly greeting you, there is a strange silence or pause of “dead air” before a real person comes on the line. Sometimes you may hear strange clicking or other noises in the background before a real person comes on the line. If you sue a telemarketer for calling you with an auto-dialer, you must be able to describe why you believe an auto-dialer was used. If you answer an auto-dialer call, that strange pause is occurring because the machine is telling a telemarketer you answered, and it is taking a few seconds for the telemarketer to come on the line and begin their sales pitch. If you receive an auto-dialer call and no live telemarketer comes on the line before you are dis-conneced, that may mean the telemarketing call-center that victimized you is under-staffed: the call-center doesn’t have enough live telemarketers available to handle all the auto-dialer calls its machine is getting people to answer. If you answer your phone only to be greeted by a pre-recorded message, you should understand an auto-dialer placed that call as well. If a telemarketer were dialing numbers one at a time manually and someone answers, would they then just play a recording for that person to hear ? No, they would start their sales pitch themself. It is flatly illegal for someone to call your cell phone using an “auto-dialer”. It is also a flatly illegal phone call if you answer your cell phone only to be greeted by a pre-recorded message. It is NOT illegal for a telemarketer to call a residential landline using an auto-dialer unless the phone number for that landline is listed on the National Do-Not-Call Registry at www.donotcall.gov But if you answer your landline only to be greeted by a pre-recorded message, that call was definitely illegal whether or not the landline number is listed on the Registry. Understand that the Telephone Consumer Protection Act states that the fine the telemarketer owes you is $500 to $1500 PER VIOLATION of the statute. The fine is applied for each VIOLATION, not each “call”. 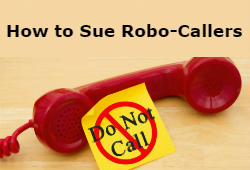 There are usually multiple violations of the statute in each telemarketing call you answer. So if you are going to sue a telemarketer, you want to pay attention to what was said and not said during the phone call. You want to be able to describe multiple violations of the statute in each call. A telemarketer’s failure to promptly, truthfully identify who he or she is calling for, during a telemarketing call, is a violation of the Telephone Consumer Protection Act and New Mexico state law. Telemarketers almost always fail to comply with this part of the law – which is why accurately identifying them so you can sue is such a big deal – more on that below. Even telemarketing calls made manually by a real sales-person (not using an auto-dialer or machine) are illegal if the number they are calling is a residential number listed on the Do-Not-Call Registry. If you have told any particular salesperson not to ever call you again, they are obligated to put your phone number on an in-house “do not call” list and they owe you the statutory fine if they call you again – even if it wasn’t a call using an auto-dialer or machine. A text message counts as a phone call. If you are harassed by marketing text messages, and it appears these texts are sent out on a mass-scale using some type of machine or computer program, the Telephone Consumer Protection Act protects against these too. Even telemarketing calls you don’t answer count as “calls” that violate the statute – in other words you can charge a telemarketer $500-$1500 even for their calls you did not answer. If you are fed up with telemarketing calls you have probably had the experience of seeing the same phone number appear on your Caller ID, that you know is from a telemarketer so you don’t answer. If you are going to try to identify one of these callers so you can sue, you want to try to document even the calls you didn’t answer so you can make them PAY YOU EVEN MORE MONEY. Telemarketing calls using “spoofed” phone numbers are frequently illegal and a violation of the statute as well as various state-laws. “Spoofing”, or to “spoof” a telephone call, is the practice of causing the Caller ID of the recipient to indicate the originator of the call is at a station or location other than the true location. A telemarketers’ auto-dialing equipment, actually located in California for example, can be programmed to use a VOIP number with 505 area code to display the local-area-code VOIP number on the called persons’ Caller IDs. So if for example a telemarketer wants to harass people in New Mexico, the telemarketer might use VOIP numbers that display a local 505 or 575 area code. Telemarketers like to use VOIP numbers with the local area code of the area where they are harassing people, because people are more likely to answer their phone if they think the call is from a local caller. Serial illegal robo-callers routinely spoof Caller ID to try to conceal their true identities and whereabouts, because the primary method telemarketers use to avoid any consequences for their intentional, unlawful conduct is their intentional use of even more unlawful conduct: they refuse to adequately identify themselves to the victims of their conduct. How can you sue someone if you can’t accurately identify or locate them? The most difficult part of suing a telemarketer is accurately identifying and locating them. Generally the first live telemarketer you will be on the phone with is someone at the call center that is directly responsible for the call. These people will only lie about who they are and where they are. They are trained as part of their job to systematically LIE. If they actually TELL THE TRUTH about who their employer is, they will be fired. They will never, ever tell you the truth about who they are and, if you start asking too many questions or the wrong questions they will hang up the phone on you. But if you indulge them and don’t make them suspicious enough to hang up the phone on you, you can very often get transferred to the actual business that hired them to harass you. There are a variety of ways to get the actual business to accurately identify themselves. After all, since you were transferred to them they think they might actually be rewarded for their illegal conduct by talking you out of some money to buy something from them. Getting the business you were transferred to, to then send you an email is “the holy grail” of identifying the parties responsible for illegally harassing you, but receipt of an email isn’t absolutely necessary. A lot of times you can identify the business that is using illegal telemarketing by just talking to the sales-staff enough and taking notes about what they say. Then with adequate research they can be identified. Maybe they were selling a unique product or wanted you to look at a specific website. See if they will agree to call you back at some later date then wait to be called by someone at their real, in-house phone number – not the number their third-party telemarketers used. Another way to identify them, for example, might be if they are selling a relatively inexpensive product. If the product doesn’t cost that much, you might consider just buying it. Then, you can start sending subpoenas to follow the money trail until you find out who got your money. Wait for the product to arrive and you can find out easily enough who shipped it and who told the shipper to ship it. There’s your legitimate business that decided to use illegal telemarketing to harass you. Another fun way to identify the parties responsible for the use of illegal telemarketing, is if the telemarketer wants you to agree to meet with one of their “local representatives” or “local contractors”, like to sell you solar panels, a time-share, an insurance policy or a home security system for example, or some other crap you never asked to receive telemarketing calls about. If the only way to identify them is to let the telemarketer arrange a meetup, why not schedule one? You can bet the local business that is using illegal telemarketing will call you or try to visit your home. Or if you were invited to an in-person sales presentation or seminar or something, go ahead and pay them a visit. The actual business using illegal telemarketing will then be easily, accurately identified. There are other more sophisticated ways to identify illegal telemarketers. If you are fed up and want help identifying them so you can sue, Call-Childress at 505-433-9823. Figure out if all the phone calls you answer show up on your phone bill. If the phone call is documented on your phone bill statement, very good. If for example a missed or unanswered phone call does NOT show up on your phone bill, is there some type of “missed call” log you can photo showing the call? Most smart-phones have call logs that show the date and time of missed calls including the number that showed up on your Caller ID. You can photograph these call logs. It can be good to screenshot your phone’s call log even for the calls you answered. Also, if you are going to sue a telemarketer, make some notes about what was and was not said during the phone call. Make these notes as soon after the call as possible when the matter is fresh in your memory, and save these notes. You want to be able to give a good description of the conversation. Being able to refer to notes you made, and being able to say you made the notes shortly after the phone call when the matter was fresh in your memory, can be very persuasive. It can be helpful, if you are going to sue a telemarketer, to call the number back that illegally called you, just to see what happens. Most auto-dialers are programmed to only place outbound calls – they do not allow in-bound calls (you calling back). Another tell-tale sign that an auto-dialer was used, is if you call the number back and there is no answer or you just get some programmed message before the line disconnects. Make notes about what happened when you called back too. Sometimes the auto-dialer that called you will actually accept your callback or inbound call. These can be interesting if a telemarketer comes on the line. If this happens, and if recording your own phone conversation is legal in your state, consider setting up a recording device and record the conversation. Ask the telemarketer for example to state exactly what business he or she was calling for and to state the name of the company that signs his or her paycheck. Start asking questions about why you were called despite being on the National Do-Not-Registry. Ask the telemarketer what make and model of auto-dialer or computer program is being used. Keep asking questions until the telemarketer hangs up on you. If you have already identified the telemarketer and they were dumb enough to use an auto-dialer that lets you call them back, these recordings can be excellent evidence in your favor. If you live in New Mexico and are fed up with commercial activity that invades even your home and private life uninvited, such as telemarketers who ignore the National Do-Not-Call Registry, Call-Childress at 505-433-9823. I SUE TELEMARKETERS. This Web site is a lawyer advertisement. Use of this website does not create an attorney-client relationship. Copyright © 2019 Sid Childress. All Rights Reserved.